Helsinki: What do you give the world's most literate country for its 100th birthday? For Finland's politicians and public, the answer was simple: a vast, state-of-the-art library, a new "living room for the nation". 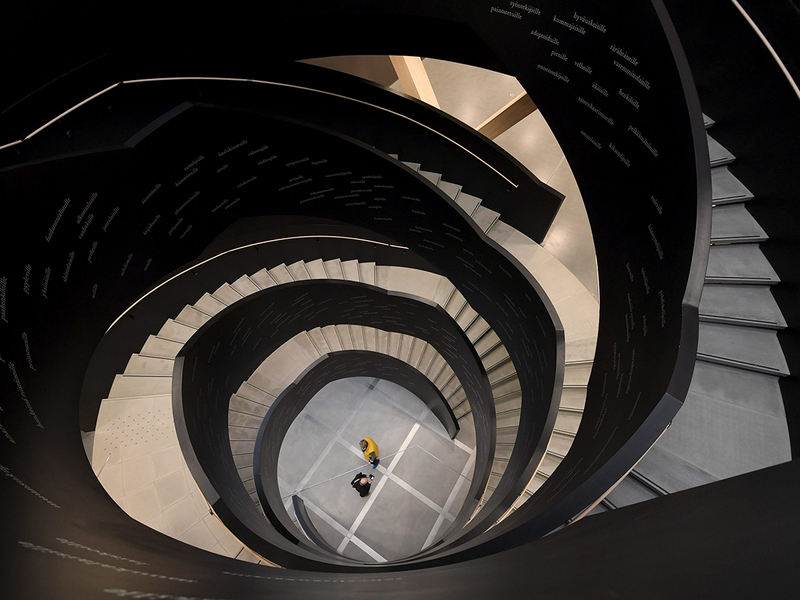 Twenty years in the planning, Helsinki's central library officially opens on December 5 at the end of a year of festivities marking the centenary of Finland's independence after breaking with Russia in 1917 following six centuries under Swedish rule. But whereas the parliament building is an austere and imposing hunk of granite, the new library was designed by Finnish firm ALA Architects as a welcoming, undulating structure, clad in 160 kilometres' worth of Finnish spruce, drawing people inside with a "warm hug". Named Oodi - "ode" in Finnish - it is intended as a paean to knowledge, learning and equality in what was ranked the world's most literate country by a 2016 report based on official statistics. As the grand opening approaches, workers are frantically trying to finish the outside of the building. Installing the flowing wood panelling has proven harder than expected in Helsinki's freezing climate. While books will feature heavily - 100,000 of them - the cutting-edge facility also boasts studios for music and video production, a cinema, and workshops containing 3D printers and laser cutters, all free of charge for the public. It will also house an EU-funded visitor centre, offering information on the 28-member bloc's work and its impact on people's daily lives. 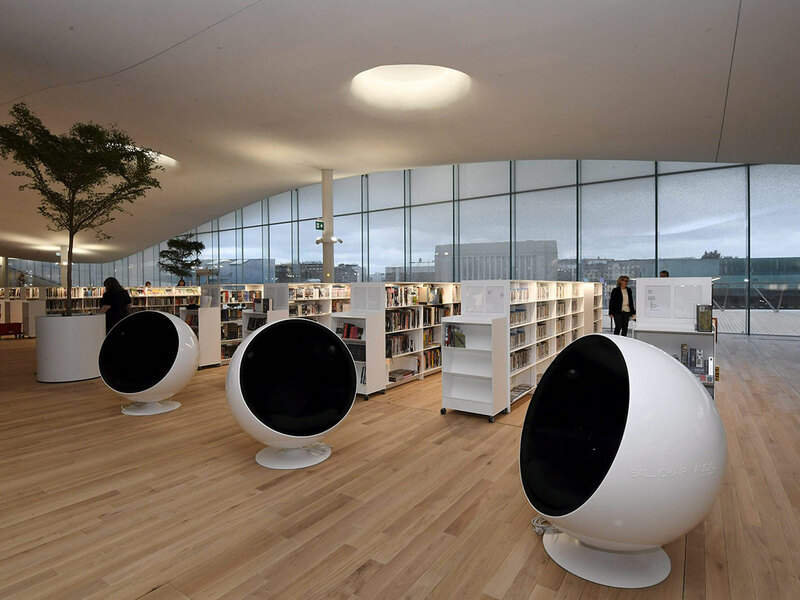 "Oodi gives a new modern idea of what it means to be a library," Tommi Laitio, Helsinki's executive director of culture and leisure, told AFP. "It is a house of literature but it's also a house of technology, it's a house of music, it's a house of cinema, it's a house of the European Union. "And I think all of these come together to this idea of hope and progress," Laitio said. One sign of such progress is the building's fleet of book-carrying robots - small grey waggons which navigate themselves in and out of lifts, avoiding people and furniture, in order to bring returned books up from the basement and drop them off at the correct bookcase. Oodi's planners believe the robot librarians are the first instance in the world of self-driving technology being used in this way inside a public library. The robots will become a familiar sight to the library's expected 10,000 visitors a day. Oodi will have areas walled off for quiet studying, but for everywhere else, there will not be a "silence" rule in force, as is common in libraries. In fact, making a mess and noise are positively encouraged inside the "nerd loft" - a place to inspire people of all ages to come together and create. Users can build things in workshops equipped with cutting-edge tools, borrow musical instruments or play games consoles. "We are prepared to constantly have discussions with the users and the staff about what behaviour is welcome in the library, but it's definitely a place of noise and all sorts of improvised activities," Helsinki's head of library services, Katri Vanttinen, said. She is particularly proud of the library's decision not to separate the children's section from the adult books. All are housed on the library's panoramic top floor: a sweeping 50-metre long space, with glass walls on all sides supporting a billowing, cloudlike roof. "We think that the noise the children bring into this floor is positive noise, we hear the future, and we enjoy that we have children's and adult literature on the same floor with no walls in between," Vanttinen said. "Acoustics have been planned really well, so even if people are shouting at one end you can hardly hear them at the other end," she added. Many countries have been cutting back on library services; however, Laitio said there were no problems winning political and public backing for the 98-million-euro ($110-million) project, thanks to the value that many Finns place on libraries. Some 68 million books a year are borrowed by the country's 5.5 million people, named the happiest in the world by the UN earlier this year. "Libraries in Helsinki are the second highest-rated public service after drinking water," Laitio said. "So libraries are really loved in Finland. And if I look at this project, a 100-million-euro investment, I hear zero to minimal protest. Actually people are really joyful and proud."